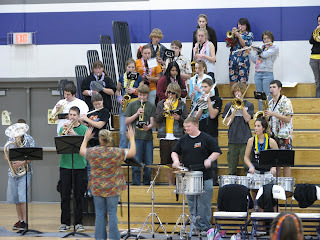 Cory has pep band tonight at the girls' basketball game. Since he brought home the schedule, I actually knew ahead of time and was thinking about going. Except that he and his friend Pam didn't want to stay for the whole game. The band gets to leave at half time, and they don't want to stay for the rest of the game. They just want to come home. I said, if I was going to go and pay to get in ($3?) then I wanted to stay for the whole game. So they decided Pam would drive, and Jeffrey and I stayed home. Besides the money thing, I just think it's kind of rude. People go for the band or to watch the dancers, and then after half time they leave. I know they are there to support their own kids, but their kids are there to support the basketball team, and it only seems right to support them until the end. Leaving at half time is kind of like putting in hardwood floors, but not getting any area rugs, or fixing dinner but not serving it. Or... never mind - it just seems rude to the kids who are playing. Win or lose, they work really hard and deserve the support. So, when I do go to a basketball game, or two, I want to stay to the end. Yes, I'll enjoy the part when the band is playing best, but I'll stay until the final buzzer. My girsl use to do that stupid stuff play the game and have the boys team watching and cheering for them then leave and not be there for the boys,,, use to just make me mad.. I do not go anylonger.... hope your keeping warm.